According to legend, in the summer of 1865, a slow-motion birch bark canoe chase played out on the rivers and in the woods near Lake Vermilion. One group was led by a geologist named Henry H. Eames, who had recently staggered into Duluth with a nail keg full of iron ore specimens and big talk about gold. The other was led by George R. Stuntz, who at 45 years of age was already considered Duluth’s most tenacious old-timer. It’s not difficult to imagine it as a comical, low-key battle of wills—the evasive enthusiasm of discovery-minded academics dampened by a plague of mosquitoes, skeptical over-burdened packers and under-paid Native guides. Government-funded geologist Eames, according to those who reported upon his journeys, was obsessed with gold. When one of his cohorts noticed that the compass was going haywire and commented that iron ore must be underfoot, Eames dismissed it. His report declared there was iron 50 to 60 feet in thickness, but more importantly, there were veins of gold and silver-bearing quartz. Stuntz, who strategically kept his group a half day behind Eames, was probably smirking a bit. He was, after all, far more familiar with the region’s geology than nearly anyone, though his expertise was obscured by the reality that he was only a surveyor, not a professional geologist. Iron had already been discovered at Vermilion in 1863 by William Posey with the help of an un-credited Native, who had brought the sample to Stuntz. When the groups returned weeks later, and all that big talk about gold-bearing quartz spread like wildfire, Stuntz didn’t interject too much too loudly. After all, he stood to benefit from development, no matter what the cause. The answer to the very arduous, upstream travel to gold country would be an ancient Native American footpath—called a “highway” by early Duluth historian Richard E. Carey—used by local Dakota and Ojibwe people and fur traders to travel between villages from Minnesota Point to Island Lake, Lake Esquagama and on to the lake the Anishinaabe called Onamuni, or in English, “Lake of the Sunset Glow”—Lake Vermilion. By October 15, a group of men, probably including Stuntz, were hacking away at the sides of the Native American trail that began near today’s 8th Avenue East and the Lake Shore to make a “winter road” for the gold seekers, wide enough not just for travelers on foot, but now for dog sleds, single-horse toboggans and even ox-teams with sleds carrying heavy mining equipment. The more experienced prospectors took dog teams rather than horses or oxen, but everyone walked, in part to keep from freezing to death, though many became frost-bitten due to lack of proper gear. Starvation and medical emergencies were constant concerns. One man, Captain Place of St. Paul, died of consumption en route, and his companions had to put his frozen body up on poles to protect it from wolves until it could be taken back home for Christian burial. One cooperative group of fifty men calling themselves “The Mutuals” held a big dance in Superior before going north. The group included future prominent Duluthians W. L. Banning and William Branch, both of whom were very involved with the construction of the Lake Superior & Mississippi Railroad at the time. Within months, eight to ten mining companies were sinking shafts and erecting mining works on Lake Vermilion, and a new town by the name of Winston was being settled along the southernmost shore. By 1867, the rush was mostly over, and word was out that the veins found mostly contained pyrite, marcasite, and pyrrhotite rather than precious metals. The usual belated reaction of lawmakers and moneymen, however, was still pushing north, despite the fact that no worthwhile gold strike was ever found. In 1868, Stuntz was hired by the county to survey and clear a decent road that could be used in the summer months as well as winter. When the money ran out, the federal government stepped in with $10,000, and Stuntz and his crew completed it through to Lake Vermilion, but not without frequent trials. Not only were there endless swamps, intrusive rock knobs, and biting insects, the food was inadequate for the 18-man crew of workers, many of whom were Ojibwe. According to fellow pioneer John Bardon, the “Chippewa Union” went on strike until they were fed bread and meat, rather than the beans, hominy, and cornmeal they said was fit only for be-be-jeke (oxen). The road was originally supposed to continue on to the Red River Settlement on the border of North Dakota and Manitoba, but Stuntz reported that the local Ojibwe, who were puzzling out the denial of their promised annuity payments, logically concluded that their missing money was going into a road they didn’t even need. They voiced their objections to Stuntz, and that they’d prefer the road end at Vermilion. In the end, they got their wish, though more likely because the institutional will and money ran out. 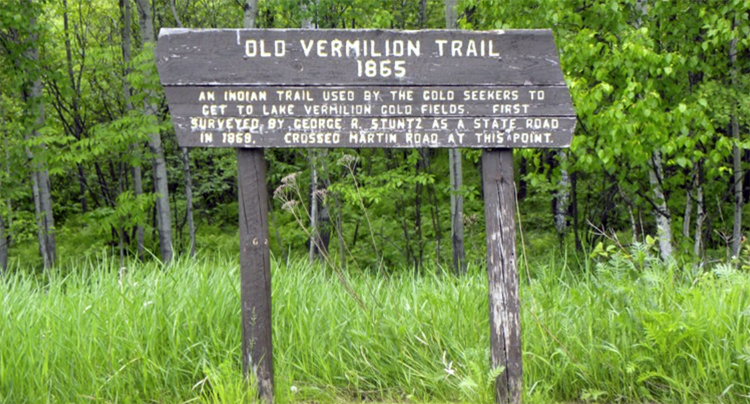 For three generations, the Vermillion Road (spelled with two Ls) was the primary road north from Duluth to the iron mines of the Vermilion Range and their supporting towns. At various times its course changed, or became impassable due to severe winters or spring washouts. Farmers settled along the road and depended upon it to bring their harvests into market. At some point, the portion of the road in the tony neighborhoods of Congdon Park, Waverly Park, and Hunters Park was named Princeton Avenue, to pair with Oxford Street. But when plans were made in 1913 to surface the road, straighten it and improve grades near the cemeteries, historically minded citizens successfully petitioned the city council to return it to its original name (also dropping the second L that had been mistakenly added along the way). The road was dirt or gravel for much of its history, and must have been an extremely bumpy journey as automobile speeds inched up to 20 miles an hour. Frequently, the newspapers ran lost and found classifieds for luggage lost on the road, along with lost tires, guns and expensive coats. 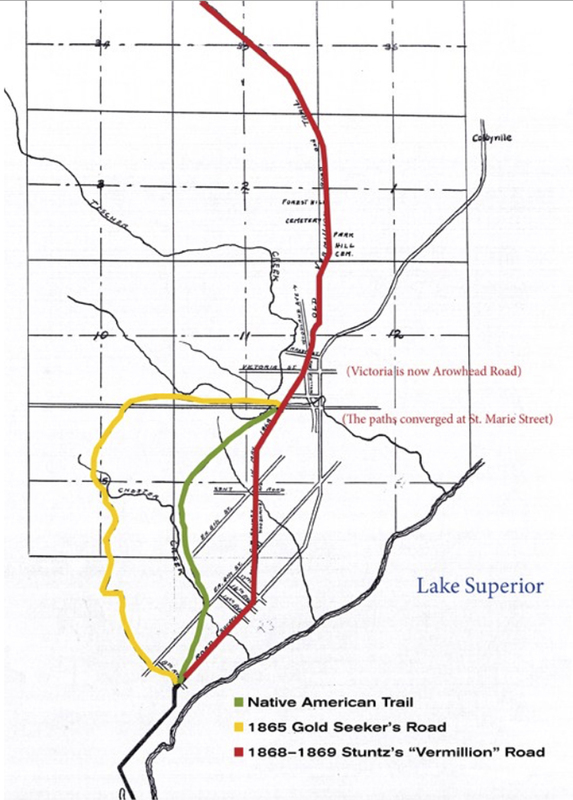 When Miller Trunk Highway was paved, however, that was the end of Vermilion Road’s use as a primary route north. This wilderness highway was laid out and built in 1865 by white men and Indians, under the direction of Surveyor George R. Stuntz, a notable pioneer of this region. Originally planned to serve the army of prospectors that for five years journeyed to an unprofitable search for gold at Lake Vermilion, it later furnished access to the genuine wealth of the Vermilion iron range. To identify and perpetuate this historic site, this memorial is presented to the city of Duluth by Daughters of Liberty chapter of D.A.R. 1933. When I-35 was built, on the orders of Mary Gary Doty the marker was removed and it was reinstalled along the Lakewalk behind Fitger’s Brewery Complex in a location that has no historic connection with the Vermilion Trail. Story by Heidi Bakk-Hansen. Originally published on Zenith City Online (2012–2017). Click here for more stories by Heidi Bakk-Hansen.